What’s in our food has never featured more prominently in the news debate, and the issue is at the forefront once again. Mars, the company behind Dolmio and Uncle Ben’s has informed the public that its many of its products should only be consumed once a week due their high salt, fat and sugar content. It has decided to introduce a new label advising consumers that the products, such as its pasta sauces, should be only eaten ‘occasionally’. YouGov BrandIndex enables us to gauge public reaction to the news. Across several metrics, there is alarming news for Dolmio. YouGov’s Buzz score indicates whether a respondent has heard anything positive or negative about a brand in the past two weeks. On this front Dolmio’s score has plummeted. Prior to story breaking, its score was +3 – it is now heading south, and is currently at -10. This has been reflected in the brand’s overall Index score (a combination of metrics including Impression, Reputation, Quality, Recommend and Value). Dolmio’s Index score has fallen 10 points in the last week. 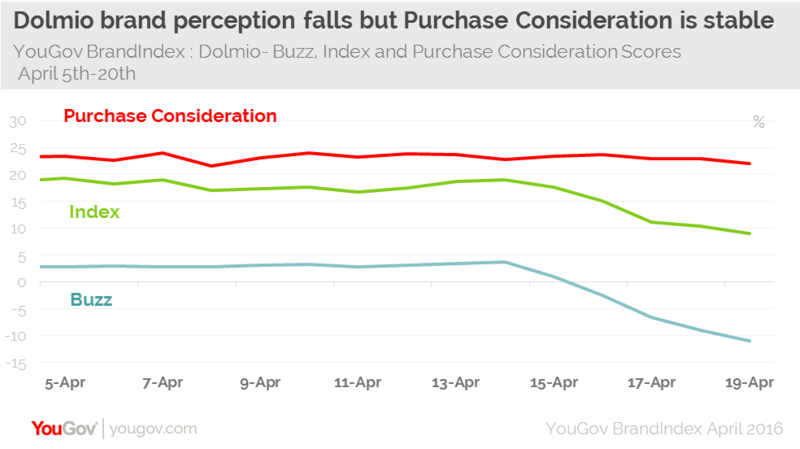 Crucially however, Dolmio’s Purchase Consideration score (whether a respondent would consider buying a product) has barely dropped at all, with a score of +21 only slightly down from a week ago. While on the face of it, Mars appears to have taken the unexpected step of dissuading potential customers to buy their products on a regular basis, there is a careful considered announcement. YouGov’s consumer research indicates that 1 in six (16%) people buy a pasta sauce product once a week. Only 2% buy more often than that. Mars have been able to come across as a ‘friend of the consumer’ with its nutritional advice, knowing that the majority of its customers are only ‘occasional’ purchasers in any case. Therefore it’s no surprise its Purchase Consideration score hasn’t wavered despite the negative press. Customers may be surprised, but are respectful of Mars’ decision to make this known, and realise that in the main, they don’t exceed this particular warning. Mars has been prescient in recognising how quickly the public debate around food content has moved on, and made positive steps to persuade customers it realises the changes it needs to make. This is a very clear indication of the direction Dolmio’s marketing efforts should be going. Appealing to younger consumers as they begin to embrace the concept of food labelling will be crucial to ensuring the brand comes out of this period enhanced, both in terms of sales and perception. Dolmio should be encouraged by the responses from the youngest age group in our study. It finds that 18-24 years old are the most likely to eat a pasta sauce once a week (24% compared to 8% of 55+). At a very basic level, there is far greater enthusiasm to products labelled ‘occasional’ among this group. Almost half (49%) of 18-24s say that would buy a product marked ‘occasional’, compared to 25% of 55+. They are also far more likely to believe labelling in that way would inform purchase decision making. 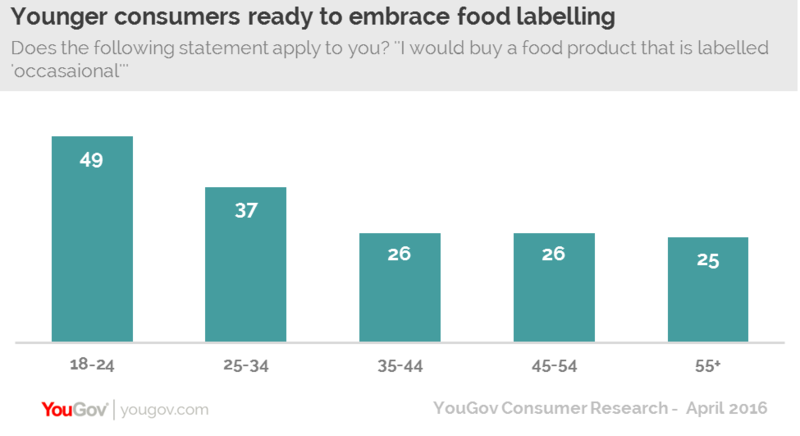 Almost 3 in ten (28%) of 18-24s believe that ‘occasional’ or ‘everyday’ labelling would help them determine whether to purchase a food product or not. Just 17% of 55+ say the same. Finally, they are the most likely to say that the consumer is responsible for the amount of fat, sugar and salt that is consumed. 47% of 18-24s say this compared to 36% of 45-54s. All in all, Dolmio are in a position to move on from this episode with its reputation enhanced. It does however, need to adapt to the challenges ahead in order maintain that support from its target demographics.